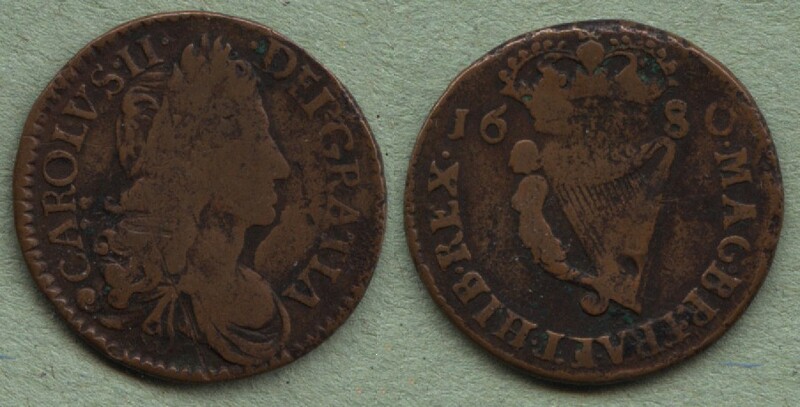 This coin is a Charles II halfpenny struck in Dublin in 1680. This is the very large date variety of the coinage. The 1680 coins occur with three different date sizes - the small date type continues through into 1681 and 1682 so it is likely that the large date pieces were the first coins struck. This example is not particularly attractive - it is only in Very Good condition and also has some damage, most notably on the soundbox of the harp. The basic design and legends are clear but the finer detail has mostly worn away. In its favour is that it has a quite attractive colour and not much evidence of past corrosion or porosity. This variety is quite difficult to find in nice condition, but examples better than this one are offered on the market quite often. There does not tend to be much attention paid to the date size varieties on this coin, despite the fact that the difference between the varieties is quite significant. Large size : date is at least as large as the rest of the legend and in the area above the legend (above). Medium date : date is slightly smaller than the legend and is placed partially inside the legend. Small date : date is much smaller than the legend and is entirely inside the legend (see a 1681 example).